One of Iran’s most famous landmarks is the Azadi Tower. 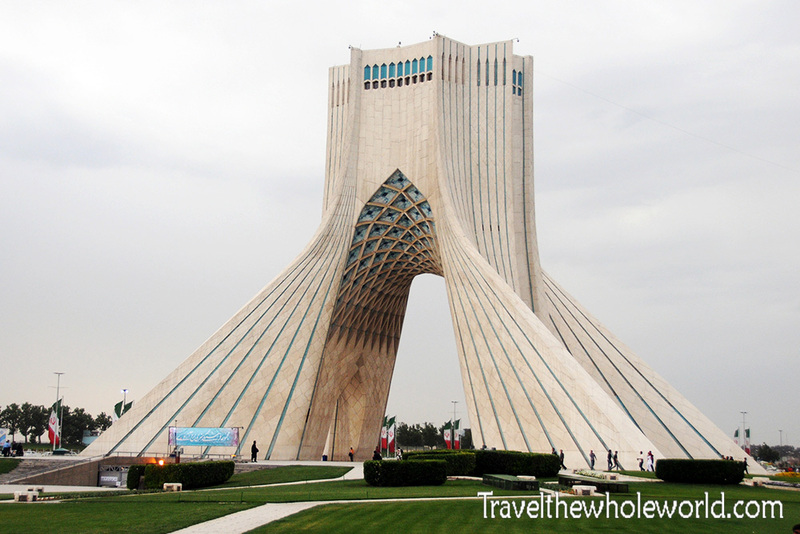 Built in 1971, the tower commemorates the 2500th anniversary of the Persian Empire! When it was first completed it was called the Shahyad Tower which translates to “Kings Memorial” in Farsi. Later the tower was renamed Azadi Tower or Freedom Tower after the Islamic Revolution in 1979. 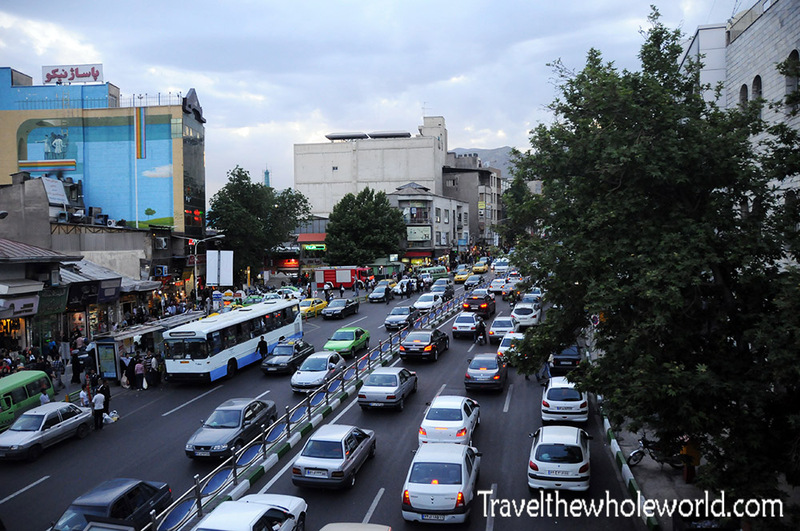 Surrounding the tower is the Azadi square, the largest square by far in Tehran and the second largest in Iran. I swung by the Azadi Tower at night when it’s illuminated by different colors of light. 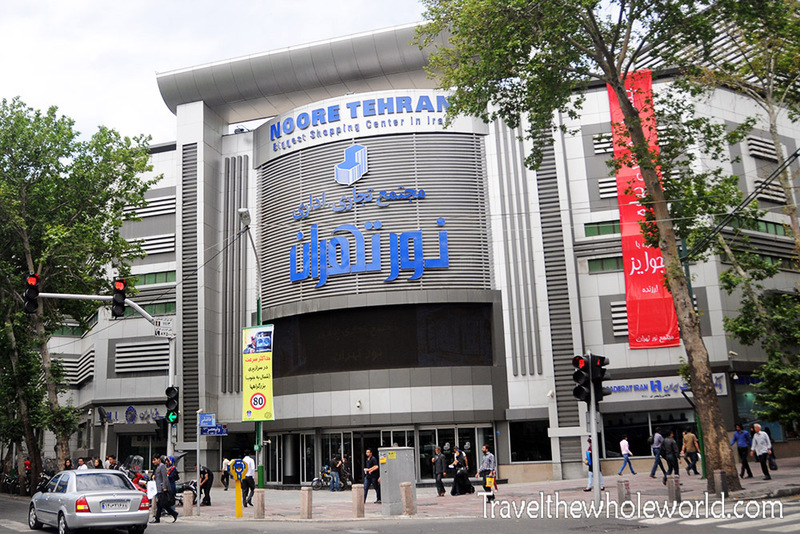 Iran’s capital of Tehran has over 8 million people in the city and a total of 14 million people in the metro area. My view from the hotel room seen above looked exactly like photos and videos of Tehran I had seen before. On a clear day in early spring the mountains in the background are even more beautiful and covered with deep snow. 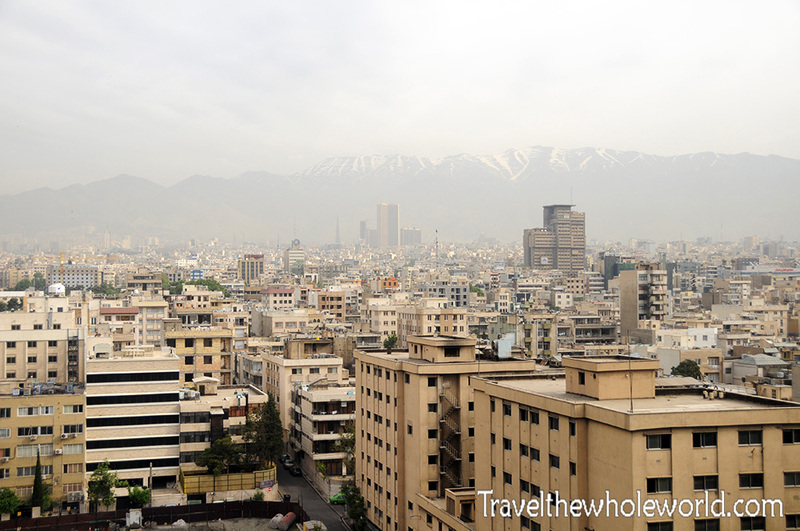 Tehran is located at nearly 4,000 feet (1,200 meters) in altitude, so it has its four seasons and even gets a good bit of snow in the city each winter. 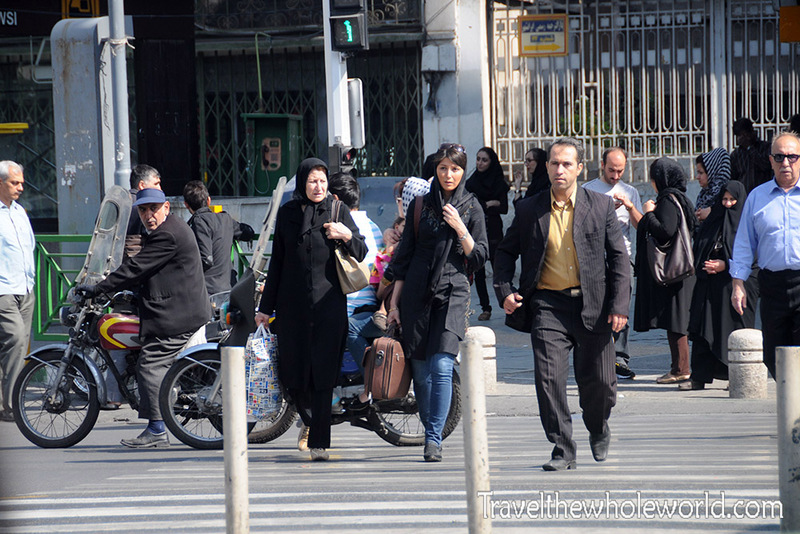 With over 8 million people in the city parts of Tehran can feel crowded. Above is one of the busy streets I saw in the city. Foot traffic in some of the markets can also be crowded as well! Despite all the people the infrastructure was good in Tehran and the city is pretty clean. Above is one of the main streets in the crowded city, below is a shot of people crossing a busy street. 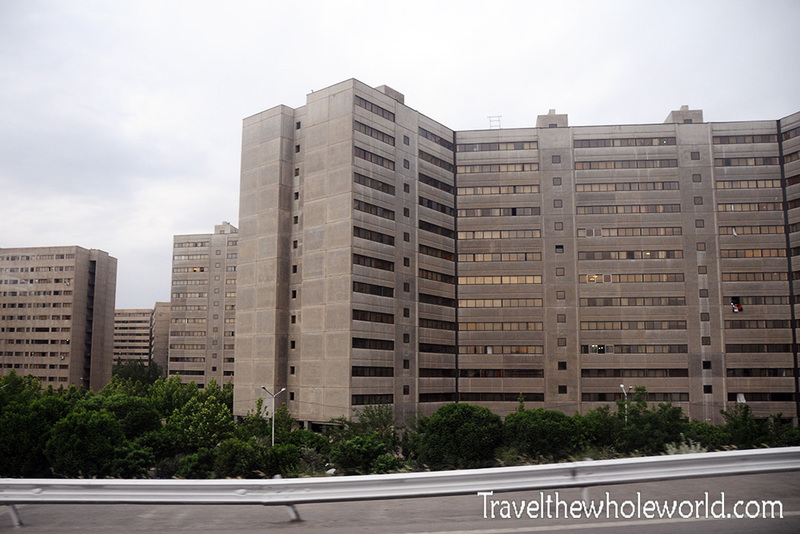 I was able to visit some apartments in one of the random neighborhoods in Tehran. Like most large apartment complexes around the world there were plenty of shops and restaurants at the lower levels. A coffee shop that I stopped by was so good I’d go there every day if possible! The prices were really cheap but there was a large variety of drinks and deserts and the quality was equal to if not better than that from a western coffee shops. There were a few people here drinking tea or coffee and smoking while rock music like Metallica and Tool played quietly on a small radio. This guy below like many locals was curious and struck up a conversation with us. 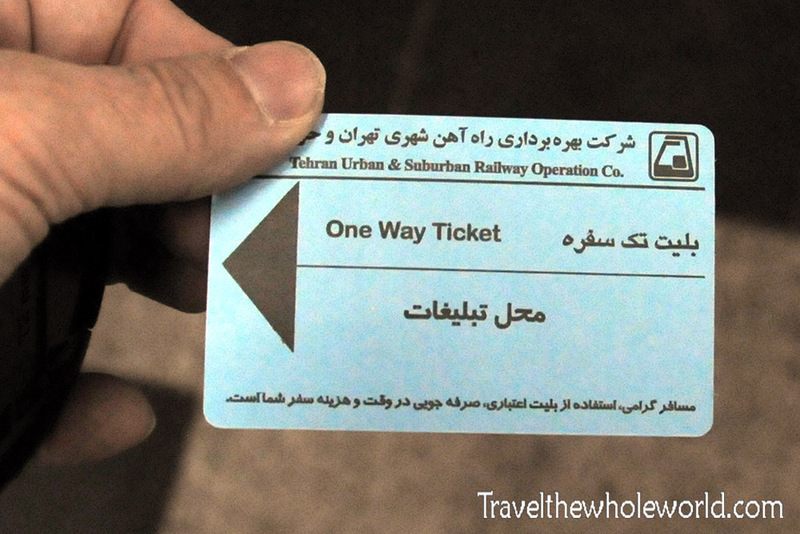 Although traffic isn’t too bad in Tehran, there is a subway that’s available although these are pretty busy as well. 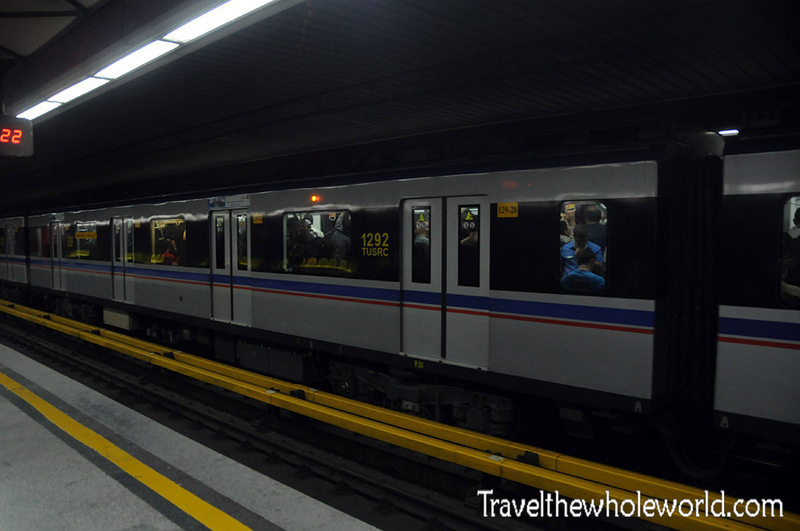 With over 8 million people in the city center you can imagine how packed the trains were. The prices were very cheap and the trains ran frequently so there wasn’t much waiting around. Above is a photo of my ticket and below you can see one of the trains passing by. Even though the decades have passed, almost everyone knows the former Shah of Iran. The Shah was seen by many as a US puppet and ruled the country until he was overthrown by an Islamic uprising. The more recent dictators that were overthrown by the Arab Spring like Mubarak in Egypt, or Saleh in Yemen were viewed as similar leaders as the Shah. Most of the population saw them as being very rich while the rest of the country did not truly prosper. That said, the Shah wasn’t very popular and when he was overthrown the majority of the country at first welcomed their new government. 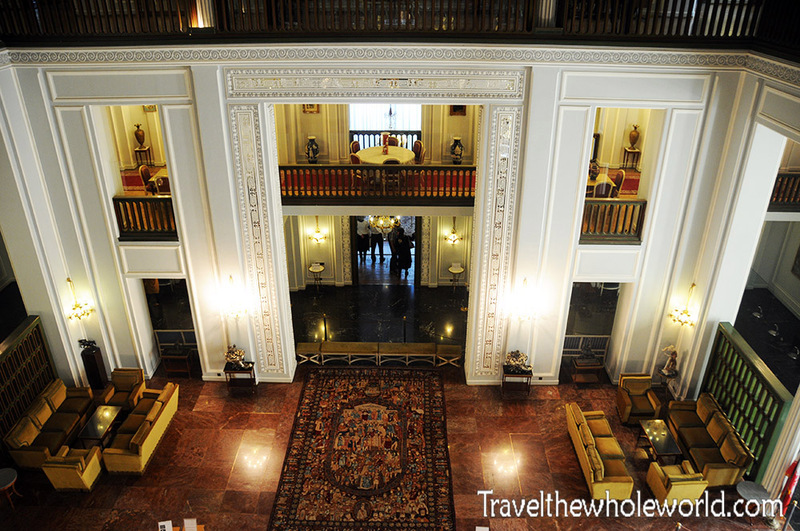 The Shah has been long gone but, but most of his residences and displays of wealth remain. His residence was more like an amusement park with palaces and playhouses in every direction. There must have been at least two dozen buildings here, all beautifully decorated. 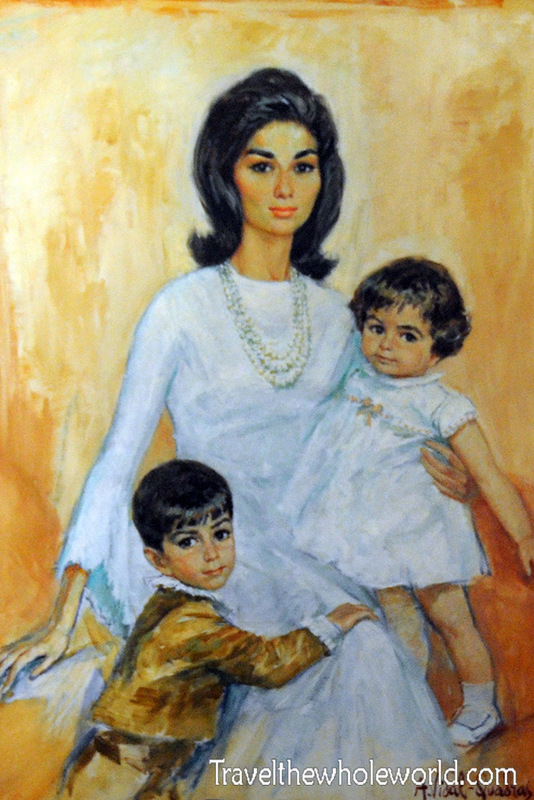 Above is a photo of the wife of the Shah, Queen Farah Pahlavi and her children. The room on the right was also her personal bedroom, supposedly the TV in the next photo was supposedly the first color TV in all of Iran! I saw her portrait a few times in the palaces here but never saw any portraits of the Shah. It turns out that the former queen fled to the Washington DC area in exile and now lives about 20 minutes from me in Virginia. When the royal family left and were replaced by the new government, immediate and drastic changes to the way of live for ordinary citizens were put in place. All women suddenly had to cover their hair while in public, regardless of their religion or nationality. Iranians were finding that many things that were once a normal part of their everyday life were now banned. 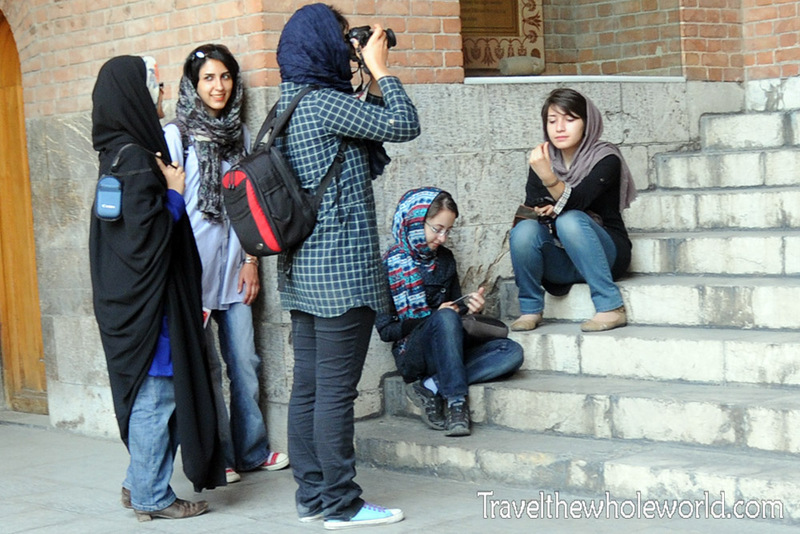 Despite these laws I found it interesting that out of all the countries I have visited in the greater middle east, Iran had some of the most western dressed population. Men wearing shorts or women wearing skirts and not covering their hair is out of the question. 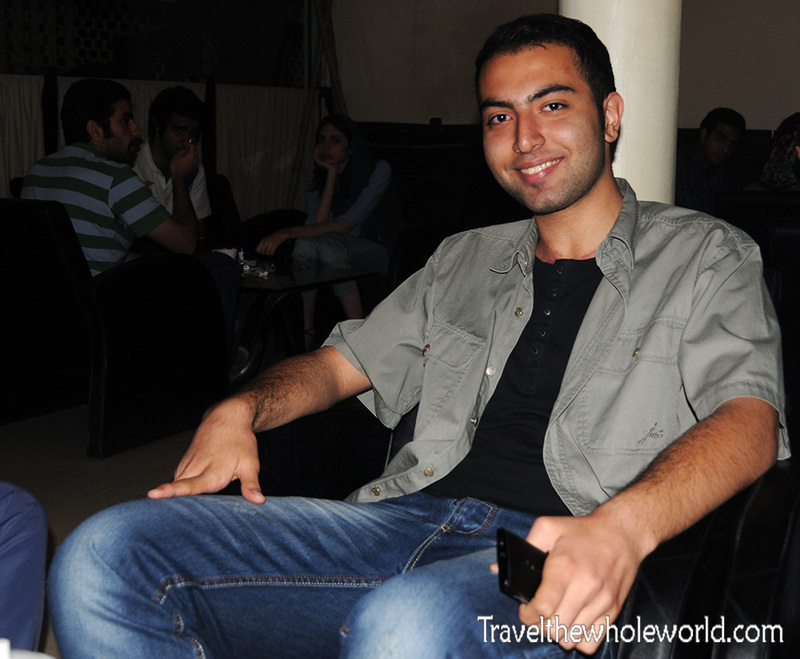 Wearing jeans and T-shirts however is widely accepted and is how the majority of Iran’s youth dress. 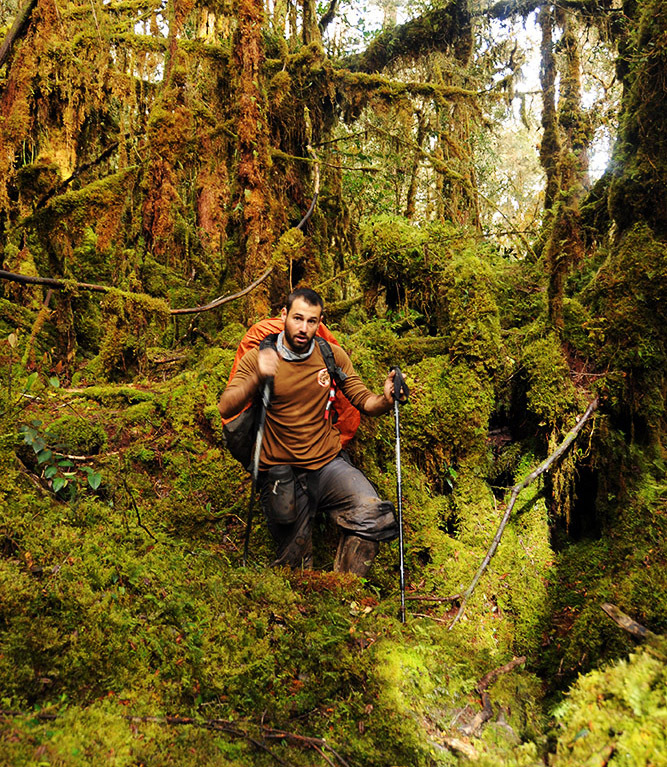 As a matter of fact, there isn’t as much a culture shock here as you might think. As I said earlier, many Iranians are very open, if you walk around for an hour expect at least one or two people to approach you and strike up a curious and friendly conversation. Of course you won’t find any rock concerts in Tehran and alcohol is strictly forbidden, but it seems many Iranians do a quick getaway to Turkey where a visa isn’t required and they can do the things that are illegal here. One Iranian I met described how he flew out to Turkey at 5am for a hard rock concert and flew back to Iran the next morning after pulling an all nighter! As a matter of fact, I boarded the flight from Turkey and not a single woman on the plane wore a veil, but by the time we landed every single one had their hair covered! 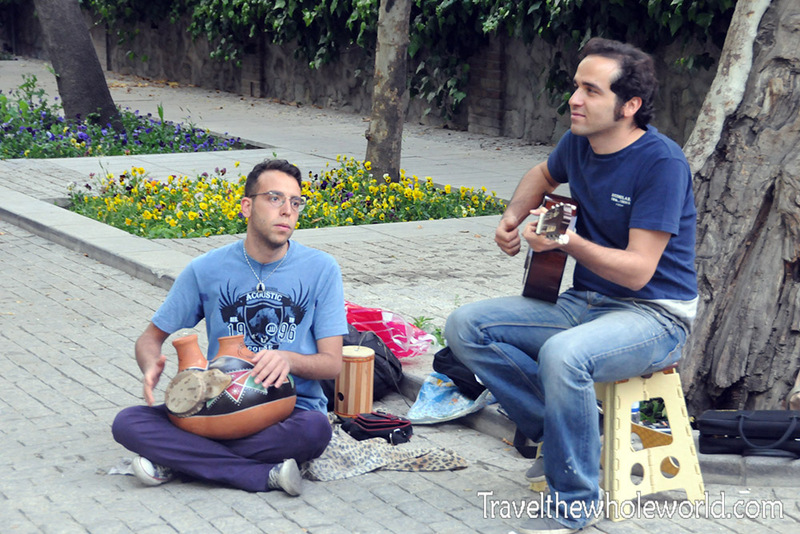 Above are some Iranians playing music in downtown Tehran. Somethings don’t change around the world! 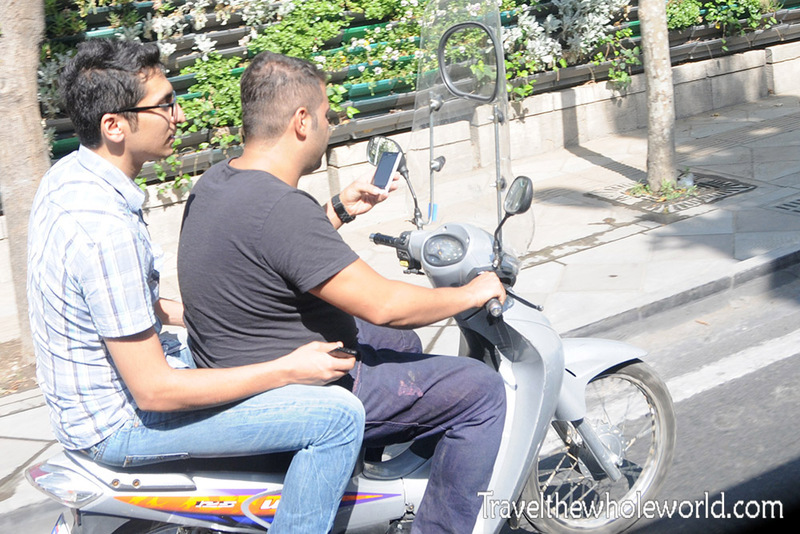 The guy texting and riding is a serious problem everywhere. I think if I was the guy on the back of the motorcycle I’d have something to say. 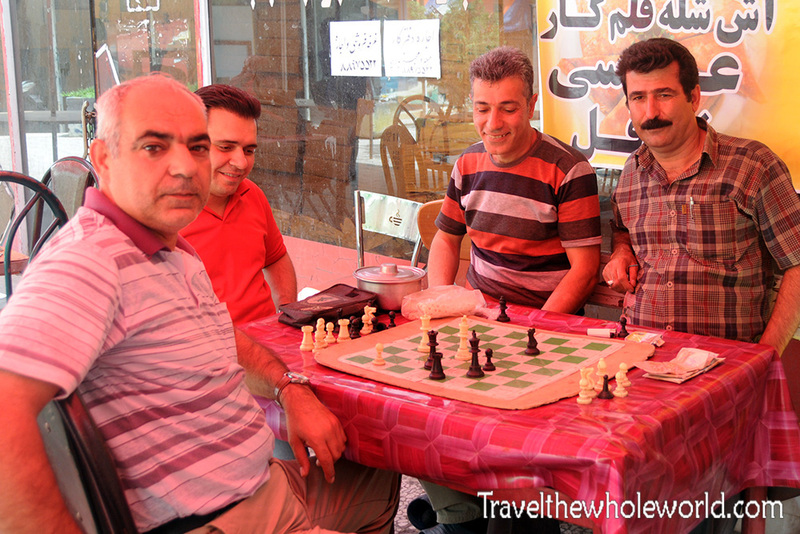 I went to get some ice cream in one part of Tehran when I came across these guys below playing chess. We wouldn’t really talk because of the language barrier, but they were nice enough to let me take their photo. To be honest, I expected Tehran to be a little beat up because of all the sanctions imposed on the country. If anything Tehran appeared to have a strong economy with shops staying open late and huge crowds of people going from place to place. I’m sure the sanctions have taken their tolls in many ways that aren’t visible to a traveler, so I can only imagine what the country might look like if they were no sanctions at all. Of course there are some ways to get around some of the sanctions. 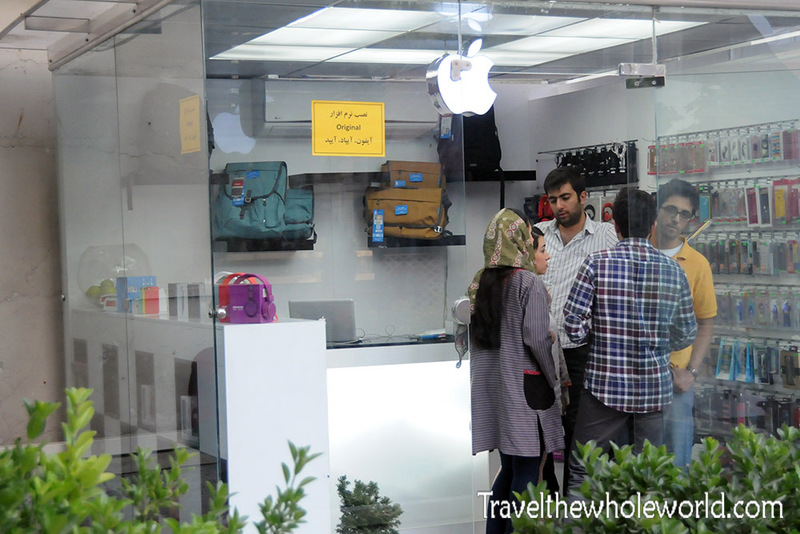 For example I saw several apple stores and other items that should be banned in Tehran. I assume they buy them from places like Dubai and resell them in Tehran from unofficial Apple stores like this one above. If you notice there is a small sign that emphasizes original on the window, to give customers the confidence these aren’t knockoff Apple products. 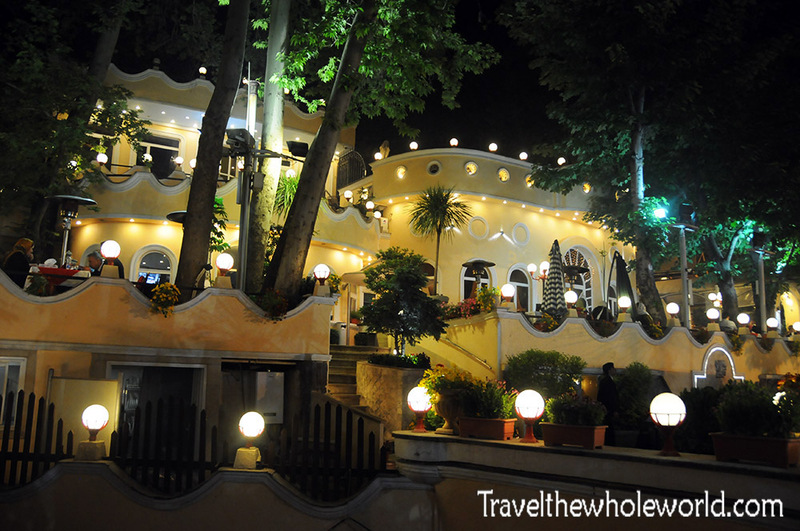 One of the most impressive restaurant districts I have ever been to was located in the northern part of Tehran. 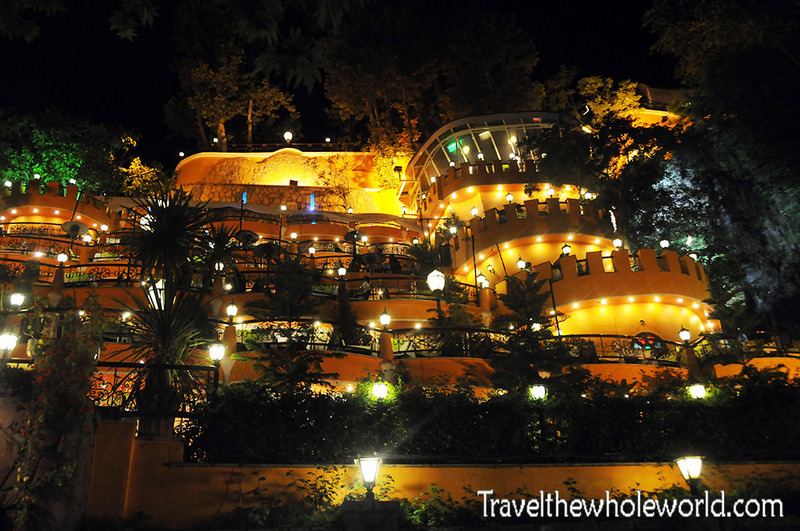 A very narrow path leads up a steep walkway that is lined with restaurants that hug the rugged terrain and follow a small river. 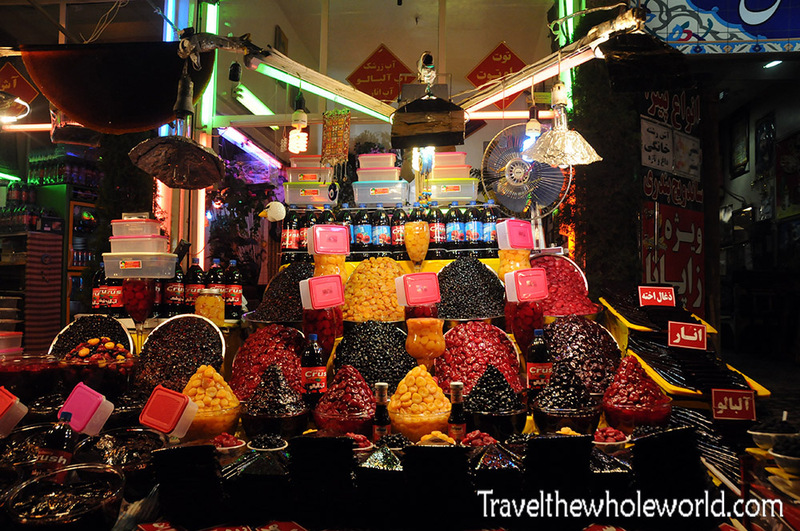 There were a few small food stands along the way like this candy for sale below, but mostly this place was filled with fancy restaurants. I ate dinner here and also found out for the first time that non alcoholic beer is pretty common. In a hotel that I later stayed at, I was surprised to see the mini bar in my room had two sodas and the rest of it was filled with various brands of non alcoholic beer. 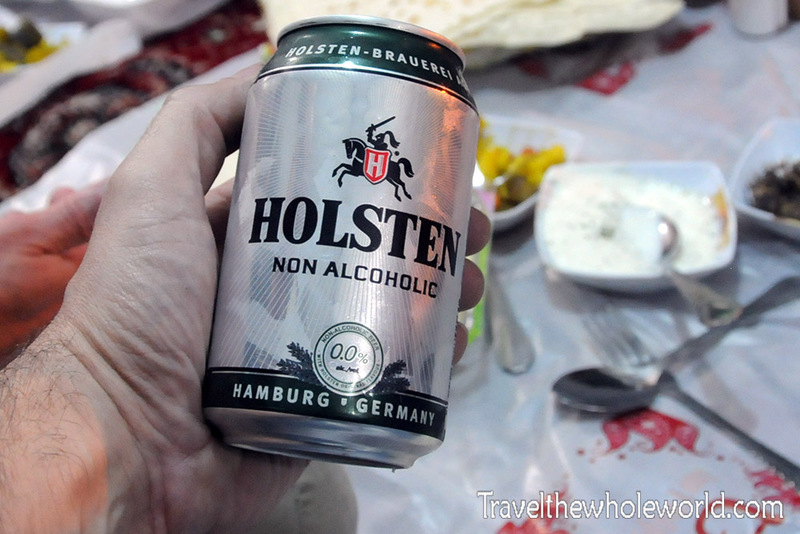 Unlike American non alcoholic beer which has the tiniest trace of alcohol, this beer here is truly alcohol free. The taste of course isn’t as satisfying as a true beer! 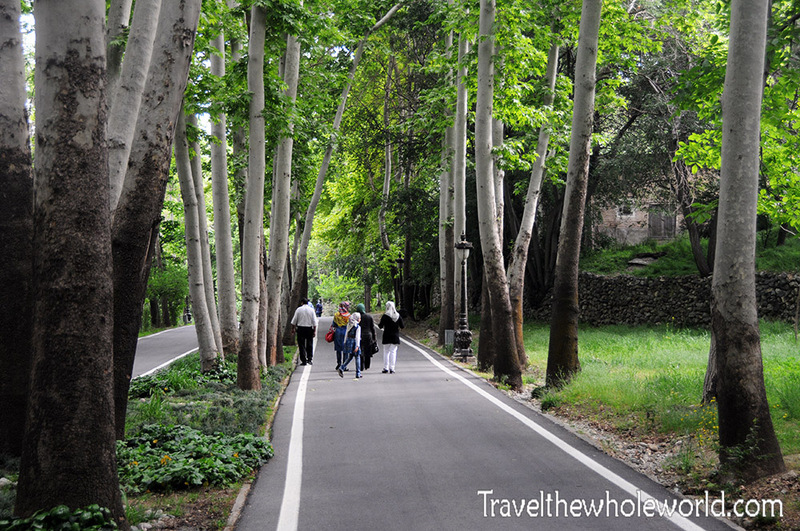 During the day there are lots of great city parks to visit in Tehran. I visited the country during spring when the weather in the capital was just about perfect, but I can imagine this being a great place to visit later in the summer. In the city parks is where you’ll find much of the youth hanging out. They always seemed to be in groups of about five people each. Either all girls or guys, never mixed! These two statues I found in some of the city parks as well. 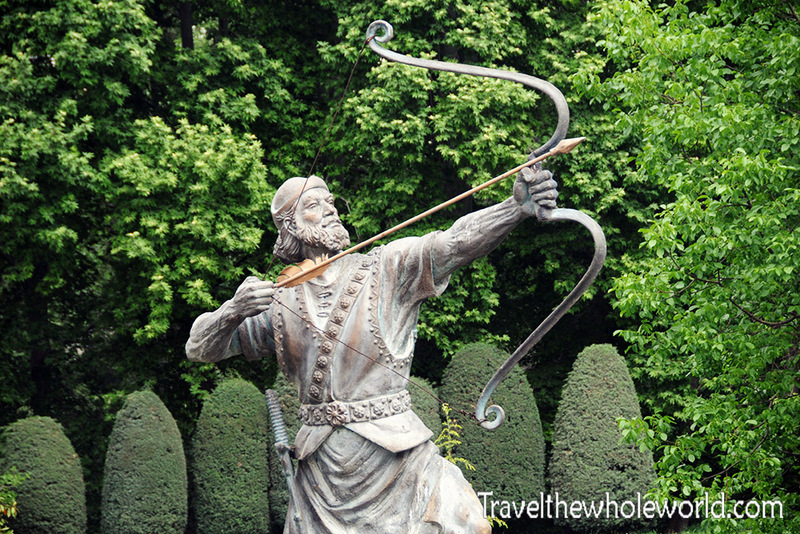 Above is Arash the Archer, a famous and important figure in Persian mythology. 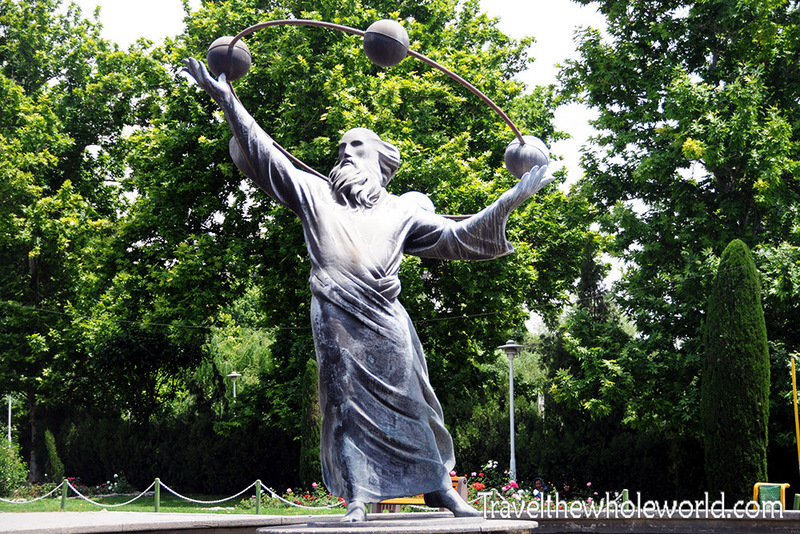 Below is Omar Khayyam, a Persian mathematician and astronomer who lived in the 11th century. He is considered to be one of the most important scientists of the entire Middle Ages and contributed a lot in mechanics, astronomy as well as new theories and rules for Algebra. 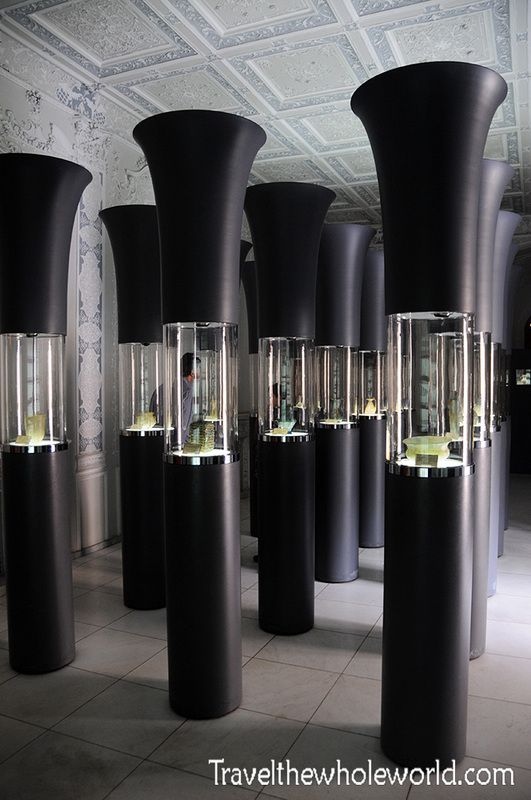 Tehran also seems to have an endless supply of museums and historic places. The photo above was taken from one of the museums I visited. 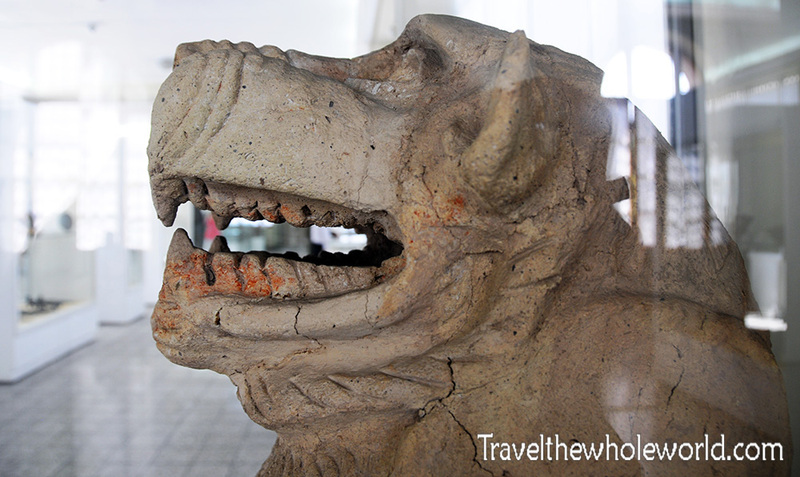 The were artifacts on display from the multiple empires and people that lived in Iran. This included a little bit of everything, from tiny trinkets created by nomadic people to giant stone columns taken from Persian cities. There were many other art museums like the museum of glass photographed above. I should mention I did pass by the former US Embassy where anti American slogans and pictures were painted. A friend of mine from Canada walked right up to the former embassy in front of Iranian police and took plenty of photos but for some reason I wasn’t allowed to. The building seemed to be vacant other than the anti-American paintings but has since been made into an anti-western museum! 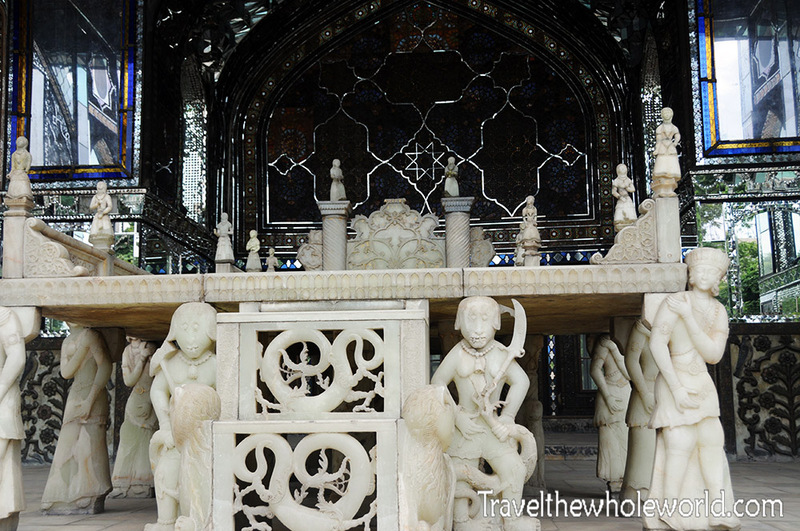 With an endless amount of ancient sites in Tehran, Golestan stands out among the rest as a world heritage site and the oldest of all of Tehran’s palaces. The palace complex above was built in the mid 16th century with various rulers using Golestan as their official residence. 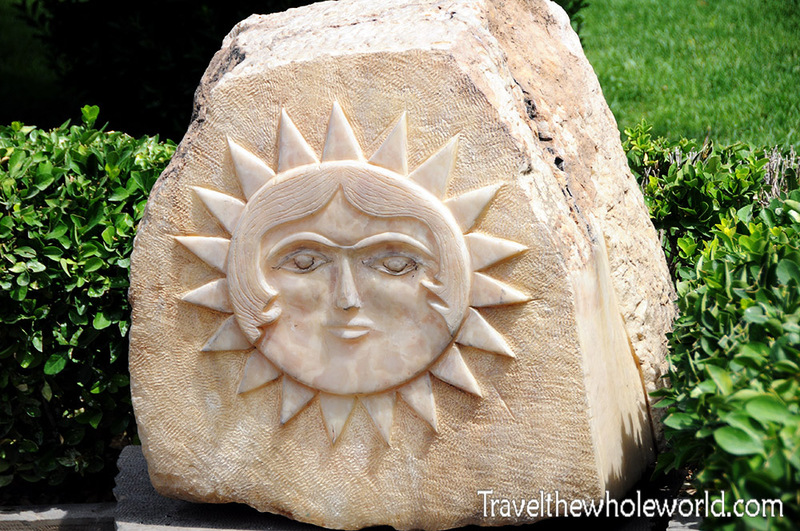 I’m not sure the significance of the Sun Stone below, but this was near a small garden in Golestan. 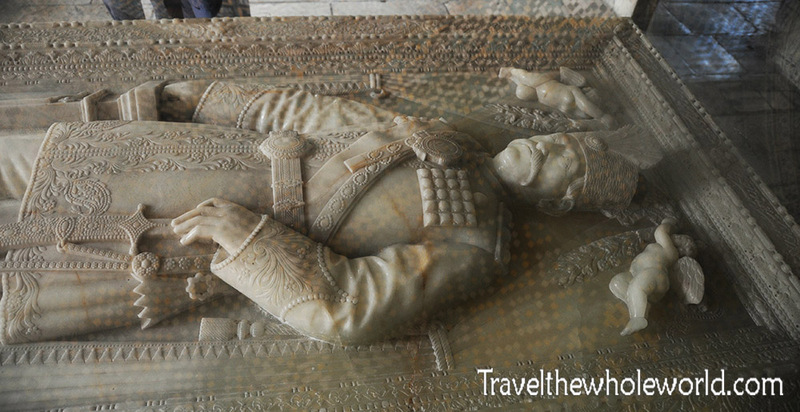 Above is the sarcophagus of one of the most known kings who lived in Golestan. Naser al-Din Shah, who was Persia’s third longest running King until he was assassinated at the age of 64. Naser al-Din Shah is known for modernizing the country by introducing a postal service, building new roads, and even some western technology during the 19th century. A few decades later, another rule of Golestan decided that the ancient buildings were getting in the way of modern structures and had a large portion of the complex demolished. Another museum I visited was the carpet museum. I learned that Persian carpets can be broken down into two different styles, nomadic and city carpets. 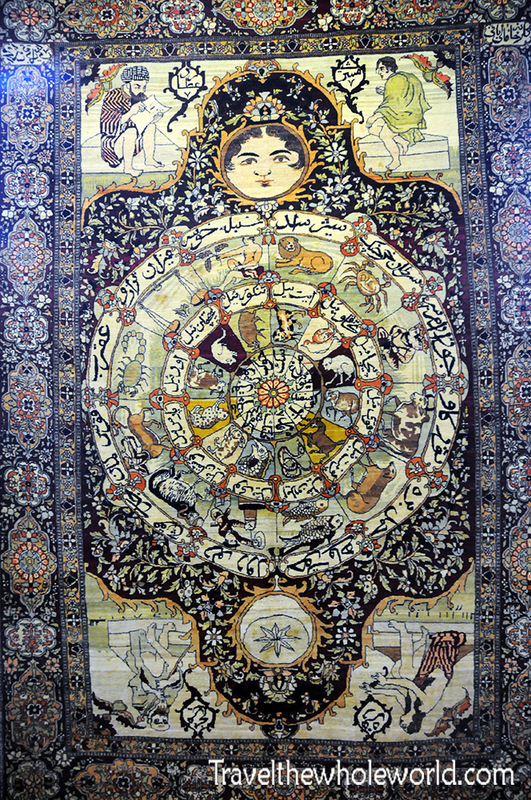 Generally, nomadic carpets are made from the artists imagination as they work. City carpets on the other hand generally follow a pre-designed map. 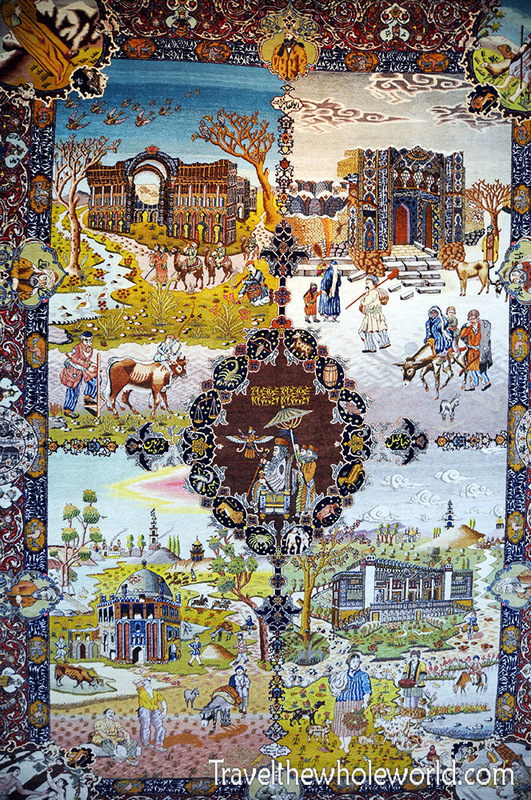 Nomadic carpets also tend to display events or tell a story. City carpets are usually more geometrical like in the photo below. 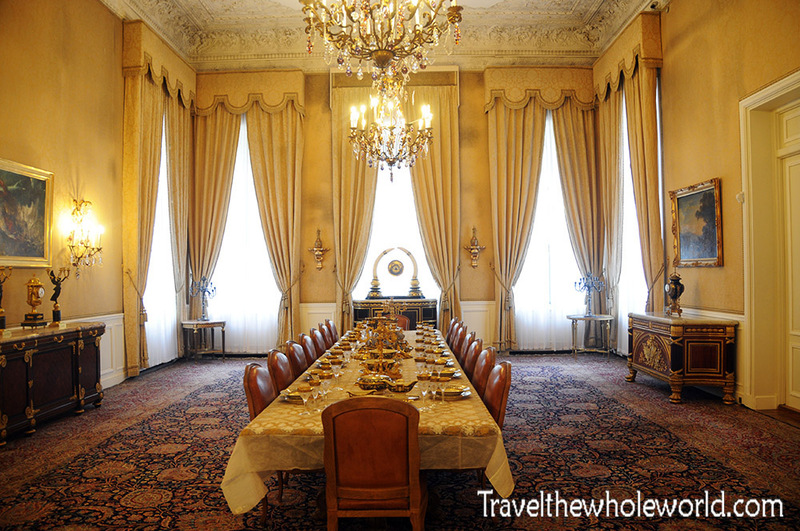 I also learned that many city carpets follow the same layout of Persian gardens with the idea of bringing a garden into the home. 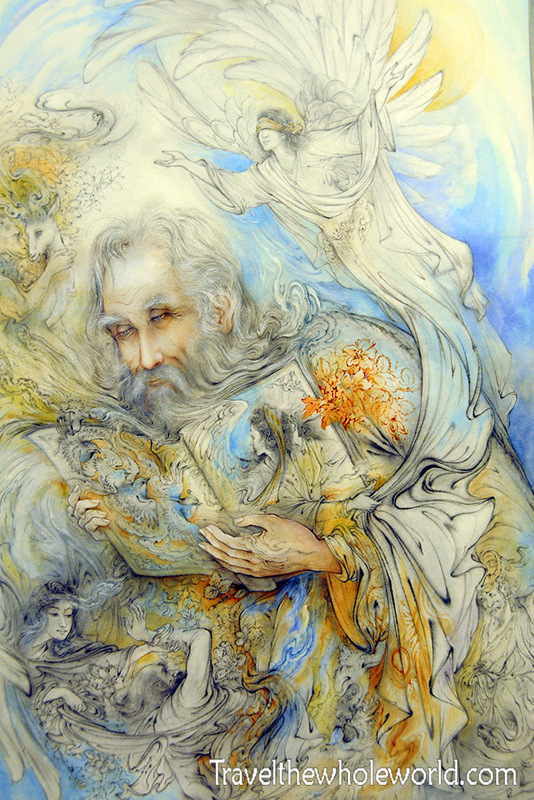 Easily my favorite art gallery in Tehran was created from a local named Mahmoud Farshchian. This internationally renowned painter put uses a painting style that was popular in ancient Persia. It later spread to other countries in the region, and mostly faded away until Farshcian brought it back. 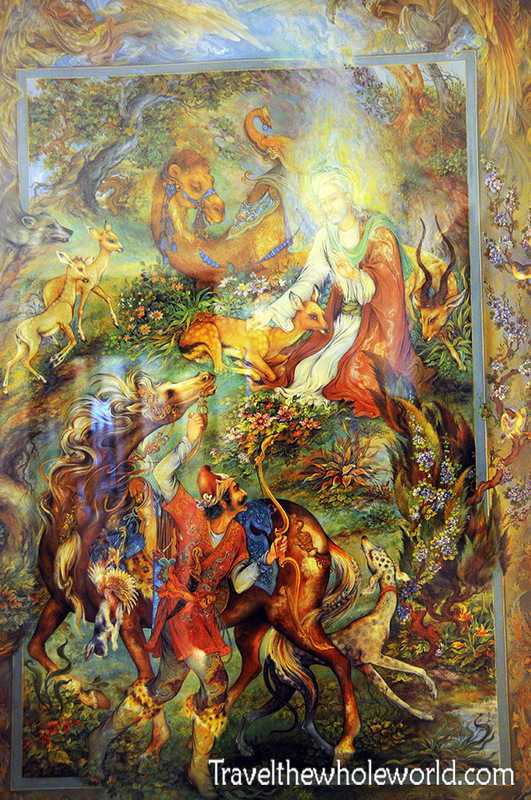 The technique is known as Persian miniature, and I thought these two paintings above and below provided a good example of what most of his artwork was like. Most of his paintings were positive, such as this one that shows an angel protecting a deer from a hunter. He did have a few paintings that were certainly a bit on the dark side, but regardless I loved them all! 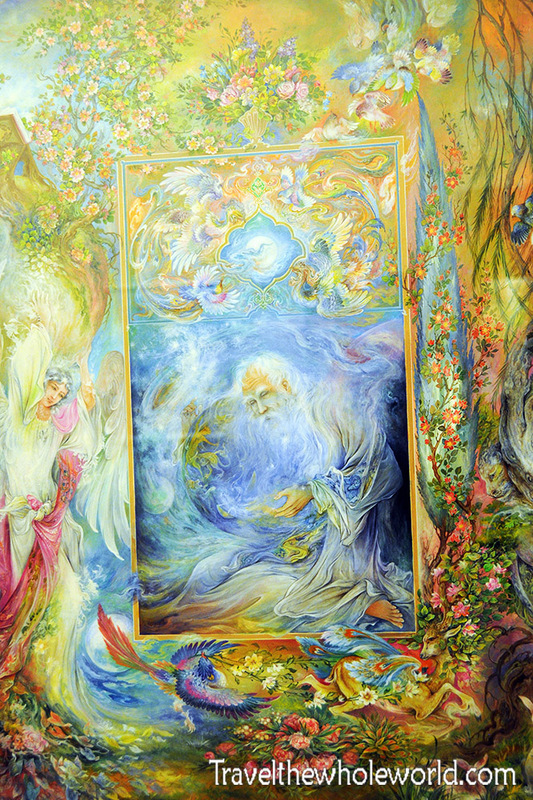 For those that aren’t able to travel to Iran to visit Farschian’s gallery, many of his paintings actually travel the world and are on display in exhibitions from the United States to Europe.